The International Agency for Research on Cancer’s (IARC) recent classification of glyphosate as a “probable” human carcinogen in Monograph 112 has garnered significant attention and calls from activists to ban the widely used herbicide. 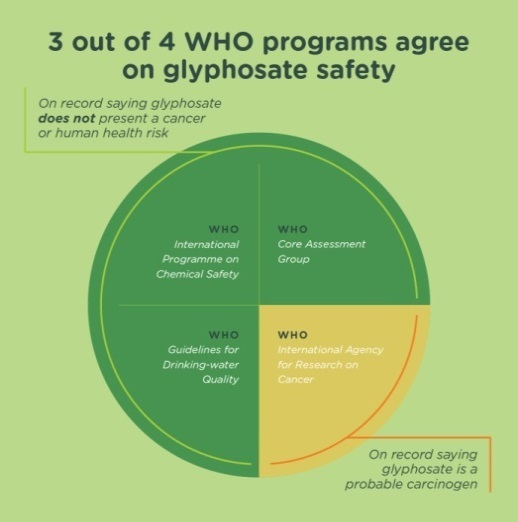 But the fact remains that an overwhelming majority of health and regulatory authorities have determined glyphosate is safe, making IARC’s classification the textbook definition of an outlier. In fact, IARC’s methodology has been called into question by the U.S. Environmental Protection Agency (EPA), which criticized the sources of research on which IARC relied and determined that there was no evidence to support IARC’s classification of glyphosate. The process underlying IARC’s Monograph 112 was plagued by serious conflicts of interest within the Monograph Working Group. Moreover, the Agency failed to explain that it conducted a hazard assessment rather than a much more relevant risk assessment, which considers numerous factors to determine the likelihood that harm will occur under real world circumstances. In the end, IARC’s classification of glyphosate provides another example of the urgent need to reform both the Agency and its processes. Glyphosate is an off-patent herbicide used to control broadleaf plants and grasses. It was registered for use by the EPA in 1974 and is currently the most commonly-used herbicide in the world. It is also one of the most studied herbicides, having undergone rigorous review by the EPA, the European Food Safety Administration (EFSA), and the United Nations. Glyphosate is an essential tool used by farmers to help produce healthy and sustainable harvests. The vast majority of glyphosate use in the United States occurs in the Midwest region, where it is mostly applied to soybeans, corn, cotton, and winter wheat crops. Glyphosate is less toxic than either caffeine or table salt. Over the last 40 years, the herbicide has been rigorously tested and studied by regulatory agencies worldwide that have found it poses no risk to human health when used as directed. Indeed, there is global scientific consensus that glyphosate is safe, and for this reason it has been repeatedly approved for use by regulatory bodies in the European Union, United States, Canada, Germany and elsewhere. The EPA alone has reaffirmed glyphosate’s safety on four separate occasions since it was first registered in 1974. Despite consistent and repeated affirmations of glyphosate’s safety and a complete lack of evidence suggesting otherwise, IARC issued a press release in March 2015, announcing its intention to classify glyphosate as “probably carcinogenic” under its hazard-based classification system. But IARC did not release Monograph 112 revealing its justification for the decision until December 2015 – nearly nine months after the initial announcement. Read about the flaws of IARC’s hazard – not risk – approach. IARC scientists are also responsible for much of this controversy as they immediately initiated a lobbying campaign to ban glyphosate in Europe on the basis of IARC’s findings. Many of the scientists authored an advocacy piece arguing for the European Union to reject EFSA’s independent conclusions. EFSA studied glyphosate both before and after IARC’s decision and determined that glyphosate did not pose a cancer hazard. While conducting a routine evaluation of glyphosate, the EPA published a risk assessment report by its Cancer Assessment Review Committee (CARC) in April 2016. CARC is the authoritative body for EPA to determine whether registered substances pose a risk of cancer and has conducted past reviews on glyphosate and numerous other substances. This report, marked final as of October 2015 and signed by all 13 of its authors, concluded that glyphosate is not likely to be carcinogenic to humans. Days later, this report was suddenly taken down from the website, with EPA claiming that it was somehow not final. EPA Administrator Gina McCarthy confirmed that the lead author of the CARC report, Jesudoss Rowland, retired in May 2016 – shortly after the CARC report was posted and taken down. According to IARC, two EPA scientists participated in writing IARC’s Monograph 112: Mathew Martin and Peter Egeghy. While Administrator McCarthy has denied that EPA staffers directly participated on the glyphosate issue with IARC, emails (link1, link2) obtained by the House Science Committee show that both Martin and Egeghy were in fact active participants in the IARC Monograph on glyphosate. Accordingly, Congress has raised questions about the divide within the Agency. In July 2016, EPA noticed its intention to form a Scientific Advisory Panel (SAP) to review glyphosate in October. On October 14, 2016, the EPA announced that the panel meeting, scheduled for October 18-21, 2016, was being postponed “due to recent changes in the availability of experts for the peer review panel.” On November 15, 2016 EPA confirmed that that one panelist, Peter Infante, was dismissed from the panel and nominated additional members. The SAP panel is scheduled to meet in December 2016. The IARC Monograph is the only reason given by the Agency to deviate from normal procedure. As part of the SAP process, EPA’s Office of Pesticide Programs released its Evaluation of Carcinogenic Potential of Glyphosate in September 2016, which expanded on the earlier CARC research, concluding that “the available data at this time do not support a carcinogenic process for glyphosate.” Additionally, EPA was highly critical of all eight studies that were cited and/or referenced in the Monograph 112 press release. EPA also deemed seven studies cited in Monograph 112 as “low quality” — including two of the primary studies used by IARC to make its glyphosate determination. In addition to EPA’s activity on glyphosate, the Centers for Disease Control and the National Toxicology Program (NTP) are now both initiating their own duplicative inquiries of glyphosate. NTP has twice completed studies that found no indication that glyphosate causes cancer.